I just came back from home a few days ago, and when the daughter goes home after a long time, surely there are all kinds of dishes she likes and invitations from all relatives. So there was I going around from one relative’s place to the other satiating my tummy with all those wonderful dishes and collecting ideas to post on my blog. Cut the onions length wise into halves, one inches piece. Heat oil in a fry pan, when the oil is heated saute’ the onions. As the onion start getting brownish add the ladies finger and salt. Fry the ladies finger till it becomes dry. Add the spices , and fry for a minute. Serve at the evening table as snacks or you can serve it as a side dish at the dinner table. 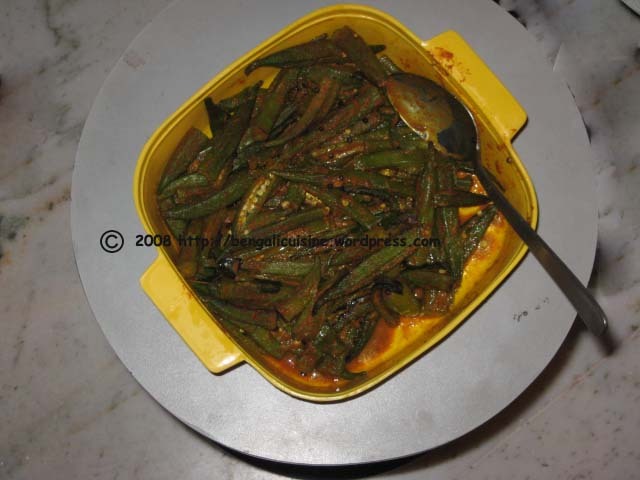 Enjoy the great South Indian style ladies finger. Happy cooking and happy eating.